Windows 10 Fall Creators update comes with a new tips section on the right side of every page, but unless you are a complete beginner, you may not be using these tips that often. 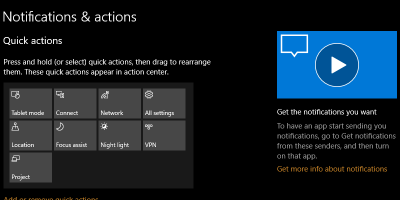 Here’s how to remove the tips from the Windows 10 Settings app. The convenience offered by online shopping is great, but you can’t blindly buy just any item. Here are 6 online shopping tips all shopaholics should know. Using public Wi-Fi can pose a number of cyber security risks when traveling abroad. Here are some tips to ensure maximum safety for frequent travelers. No one is exempt from being hacked, getting an identity stolen or any other privacy issue. Therefore, we’ve listed 6 important privacy habits everyone should follow. You can easily be overwhelmed when you first enter Reddit because of its options. Here are some Reddit power user tips to help you master it. You can improve the speed and performance of WordPress by making regular cleanups of your database. Here are some plugins to clean up the WordPress database. With a large music library at your disposal, using Spotify Premium on your mobile device can quickly consume your available storage space. Here are a few ways to conserve space on an Android phone when using mobile Spotify offline which can enhance your experience with the service. Netflix is one of the most popular streaming services around. Depending on how you watch Netflix on your PC, you may have performance issues. This guide will give you some tips on how to optimize Netflix playback on your PC. WordPress is probably the most popular CMS for new websites, and it is also one of the most highly targeted platform by hackers. If you are not sure of your WordPress security, make use of this checklist to audit and improve your site so it won’t be the next target to be attacked by hackers. Sometimes, issues show up in your iPhone and can lead to frustration and annoyance. Here’s a list of steps to go through to troubleshoot your iOS 6 device and get rid of the issues.